Selecting a safe gap is a critical skill to safe riding. 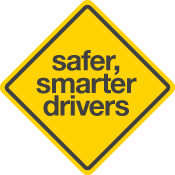 A safe gap is one that enables you to turn, overtake, change lanes or cross an intersection without affecting the crash avoidance space of other road users, or forcing them to change their speed or position. 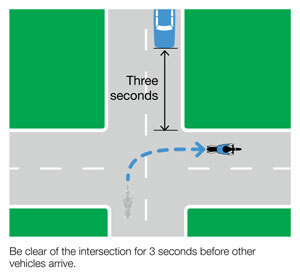 When turning across traffic, select a gap that allows your motorcycle to be clear of the road or intersection by at least three seconds before the approaching vehicle arrives. When changing lanes or joining a traffic stream, select a gap that allows you to reach the traffic speed before the approaching vehicles are within three seconds of your motorcycle. 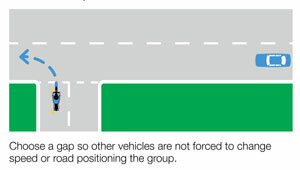 When overtaking, select a safe gap between your motorcycle and the vehicle you are overtaking AND a safe gap between your motorcycle and the oncoming vehicle. Before overtaking, do a head check to make sure that someone isn't trying to overtake you at the same time.